Anthony Yarde is willing to challenge Sergey Kovalev in the champion’s hometown. Multiple sources have informed BoxingScene.com that negotiations are ongoing between representatives for Russia’s Kovalev, the WBO light heavyweight champion, and England’s Yarde, his mandatory challenger, to fight in Kovalev’s hometown of Chelyabinsk. Their promoters – Kathy Duva (Kovalev) and Frank Warren (Yarde) – are hopeful that they’ll come to an agreement before a purse bid scheduled for Monday. They’ve discussed the possibility of Kovalev and Yarde squaring off as early as June 1 and as late as June 22 or June 29. ESPN will televise the Kovalev-Yarde fight as part of a deal promoter Bob Arum made with Duva and Kovalev to televise his immediate rematch against Eleider Alvarez two months ago. Kovalev out-boxed Colombia’s Alvarez in their 12-round rematch and won a unanimous decision February 2 in Frisco, Texas, to win back the WBO 175-pound championship. Alvarez (24-1, 12 KOs) upset Kovalev by seventh-round knockout on August 4 in Atlantic City, New Jersey, to win the WBO light heavyweight championship from him. The 36-year-old Kovalev (33-3-1, 28 KOs) will be favored to defeat Yarde. The unbeaten British contender is 18-0 and has 17 knockouts, but the 27-year-old contender is inexperienced against top opposition. That hasn’t stopped Tunde Ajayi, Yarde’s trainer and manager, from taunting Kovalev and his handlers on social media. He has repeatedly stated that Yarde, while clearly less accomplished, is the “A side” of a fight against Kovalev and won’t travel to Russia or the United States to fight for Kovalev’s crown. 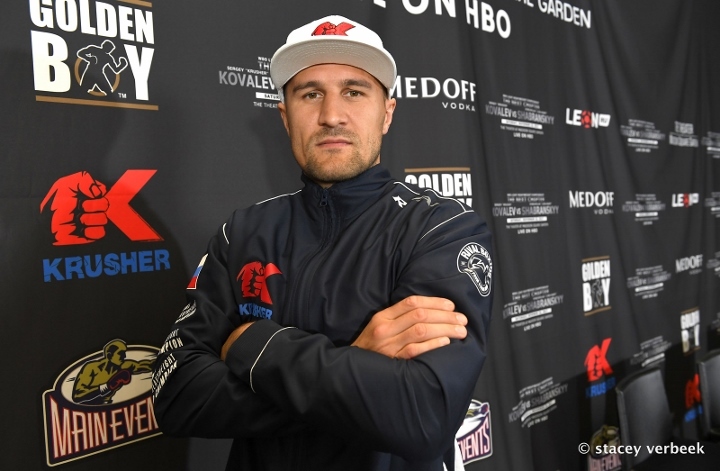 Kovalev, who resides in the Los Angeles area, has fought mostly in the United States since signing with Duva’s New Jersey-based Main Events in 2012. He last fought in Russia when he beat South Africa’s Isaac Chilemba by unanimous decision and defended his IBF, WBA and WBO titles in July 2016 in Ekaterinburg. [QUOTE=Mooshashi;19650268]Beautiful arena.....should be a great night for boxing in Russia. Is Kovalov a big enough star in Russia for Putin to attend this fight? [/QUOTE] Let's just say putin won't be there. This fight isn't signed these fools better get it done! Even though Kovelev only has the lowly WBO title he's still entitled to both a 70-30% purse split & choice of venue! [QUOTE=Mooshashi;19650268]Beautiful arena.....should be a great night for boxing in Russia. Is Kovalov a big enough star in Russia for Putin to attend this fight? [/QUOTE] Kov and putin have probably sparred each other. [QUOTE=minemax;19649933][/QUOTE] Beautiful arena.....should be a great night for boxing in Russia. Is Kovalov a big enough star in Russia for Putin to attend this fight?